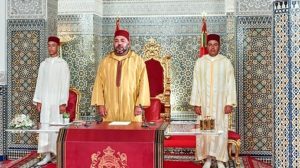 The year 2017 has been the year of clarity and firmness with regard to the Sahara issue and of a return to the standards and principles for the settlement of the artificial dispute over the Moroccanness of the Sahara, said the King of Morocco Mohammed VI. In a speech on the occasion of the 64th anniversary of the Revolution of the King and the People, the Moroccan Monarch said when dealing with the Sahara issue that this firm approach has helped put the process back on the right track, and halt the plots designed to divert it into the unknown. 2016 was the year of resolve and intransigence during which we matched action with words to thwart the schemes designed to impinge on our rights, said the King, underlining that this was confirmed by the UN Secretary-General’s report as well as by the Security Council resolution adopted last April. In this vein, the Monarch explained that in addition to the respect of the commitment to the frame of reference for a settlement, and the appreciation of the autonomy proposal as a negotiating framework, emphasis was laid on the legal and political responsibilities of the real party concerned in this regional dispute, a direct reference to Algeria, considered by many an analyst as the main obstacle to any consensual settlement of the Sahara issue. In parallel with these developments, he added, international support for the autonomy proposal has continued, as illustrated by the growing number of states, which have withdrawn their recognition of the fictional entity. The sovereign also brought up the confrontation between Morocco and the Polisario militias at the border post of El Guergarate, stressing that the proactive, composed and firm manner in which the crisis was settled thwarted the efforts to change the facts on the ground in our Sahara and helped put to rest the myth of the ‘liberated territories’ peddled by Morocco’s enemies.